‘Narrative’ is a term you hear a lot in the humanities, the humanities-oriented social sciences, and in journalism. There’s loads of scholarship dedicated to narrative. There’s many academic “disciplines” whose bread and butter is the telling of a good story, backed up by something like a scientific method. Contrast this with engineering schools and professions, where the narrative is icing on the cake if anything at all. The proof of some knowledge claim is in its formal logic or operational efficacy. In the interdisciplinary world of research around science, technology, and society, the priority of narrative is one of the major points of contention. This is similar to the tension I found I encountered in earlier work on data journalism. There are narrative and mechanistic modes of explanation. The mechanists are currently gaining in wealth and power. Narrativists struggle to maintain their social position in such a context. A struggle I’ve had while working on my dissertation is trying to figure out how to narrate to narrativists a research process that is fundamentally formal and mechanistic. My work is “computational social science” in that it is computer science applied to the social. But in order to graduate from my department I have to write lots of words about how this ties in to a universe of academic literature that is largely by narrativists. I’ve been grounding my work in Pierre Bourdieu because I think he (correctly) identifies mathematics as the logical heart of science. He goes so far as to argue that mathematics should be at the heart of an ideal social science or sociology. My gloss on this after struggling with this material both theoretically and in practice is that narratively driven social sciences will always be politically or at least perspectivally inflected in ways that threaten the objectivity of the results. Narrativists will try to deny the objectivity of mathematical explanation, but for the most part that’s because they don’t understand the mathematical ambition. Most mathematicians will not go out of their way to correct the narrativists, so this perception of the field persists. So I was interested to discover in the work of Miller McPherson, the sociologist who I’ve identified as the bridge between traditional sociology and computational sociology (his work gets picked up, for example, in the generative modeling of Kim and Leskovec, which is about as representative of the new industrial social science paradigm as you can get), an admonition about the consequences of his formally modeled social network formation process (the Blau space, which is very interesting). His warning is that the sociology his work encourages loses narrative and with it individual agency. 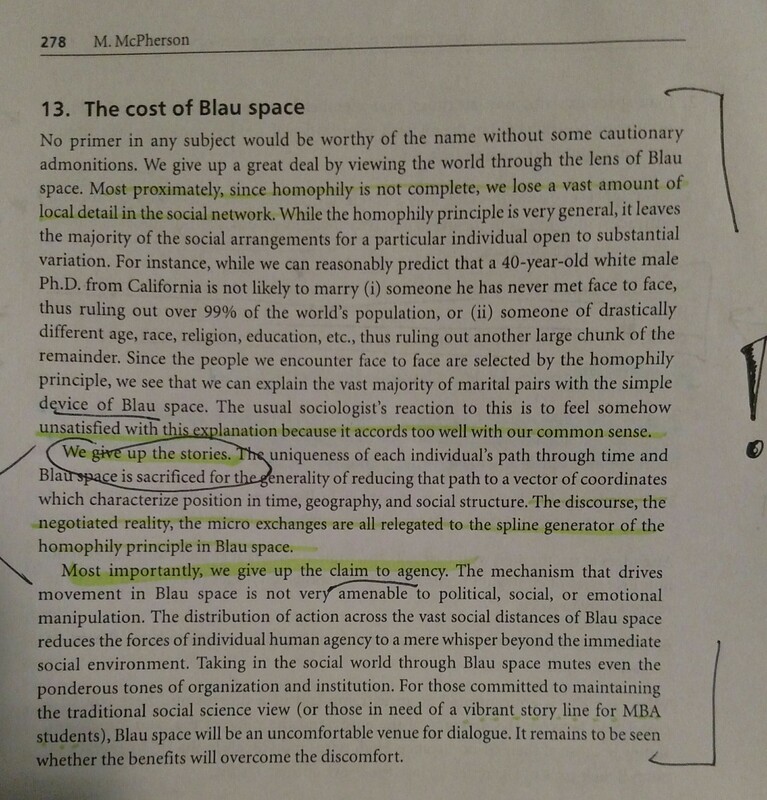 It’s ironic that the whole idea of a Blau space, which is that the social network of society is sampled from an underlying multidimensional space of demographic dimensions, predicts the quantitative/qualitative divide in academic methods as not just a methodological difference but a difference in social groups. The formation of ‘disciplines’ is endogenous to the greater social process and there isn’t much individual agency in this choice. This lack of agency is apparent, perhaps, to the mathematicians and a constant source of bewilderment and annoyance, perhaps, to the narrativists who will insist on the efficacy of a narratively driven ‘politics’–however much this may run counter to the brute fact of the industrial machine–because it is the position that rationalizes and is accessible from their subject position in Blau space. “Subject position in Blau space” is basically the same idea, in more words, as the Bourdieusian habitus. So, nicely, we have a convergence between French sociological grand theory and American computational social science. As the Bourdieusian theory provides us with a serviceable philosophy of science grounded in sociological reality of science, we can breathe easily and accept the correctness of technocratic hegemony. By “we” here I mean…ah, here’s the rub. There’s certainly a class of people who will resist this hegemony. They can be located easily in Blau space. I’ve spent years of my life now trying to engage with them, persuading them of the ideas that rule the world. But this turns out to be largely impossible. It’s demanding they cross too much distance, removes them from their local bases of institutional support and recognition, etc. The “disciplines” are what’s left in the receding tide before the next oceanic wave of the unified scientific field. Unified by a shared computational logic, that is. What is at stake, really, is logic.